Microsites are a good way to strengthen your marketing efforts. However, without a clear understanding of their role and functions, microsites will be just another gathering of web pages, waiting for their visitors to come. In the following lines, besides an understanding of microsites, we let you in on the secrets that make microsites effective in reaching their objectives. What is a microsite? This type of website consists of a page or a small bundle of pages, usually hosted on their own domain or even hosted on a subdomain. This marks their independent status as related to the parent website. What is the purpose of a microsite? Generally speaking, microsites are built with marketing purposes in mind. They serve to promote a certain campaign (e.g. for a product, service), introduce an event to the public, target a specific profile of buyer personas by “speaking their own language”. This is done with the aim to make people complete a certain action, as a microsite is intended to drive specific results (established as a target). 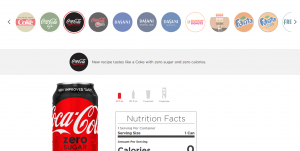 Some potential targets are: to globalize a campaign, like in the case of Coca Cola (“Taste the Feeling”), collect e-mails and contact information from users, etc. This campaign is intended to raise awareness worldwide with regards to the fight for Europe’s last wild rivers. Overall, a microsite gives complete control over a precise marketing action. Design particular to the microsite. It has to be marked by its own design, that brings to front the importance of the event/product/service/offer the company wants to showcase. The microsite can have a distinct layout, completely different from that of the parent website, like in the case above. The images are reduced to their placeholders, as compared with the large header image in the parent website. Although of smaller dimensions, they are more lively, humoristic and inviting to experimentation (“Will it Blend?”). In fact, for the microsite, the images are video thumbnail placeholders. So, the images in the parent website are replaced with videos in the microsite. This is a good use of compact content forms, where the space in the mini-site is limited. Design that borrows similarities from the main website. The design of the microsite has to inherit basic branding elements from the parent website (e.g. logo), so users can easily connect it to the main brand and the main site. As you can see, the logo of the parent website is accurately replicated to the microsite. Thus, users can trace the authors of the campaign back to Patagonia.com. Also, the image in the header of the parent website seems to find its converse representation in the microsite. Without giving up the use of imagery that’s suggestive of nature, the microsite takes this characteristic from Patagonia.com and introduces it in blueheart.patagonia.com, enriched with new meanings. Careful use of particularly important design elements: it is recommended to choose large images for the background; you should select images of products or events that grab users’ attention (the images can be customized with colored borders, frames, offset frame); it’s nice to have videos that give force of expression to the microsite; you’re allowed to use fancy fonts that underline what is special about the offer and the microsite presenting it. Creativity rules. It’s more than recommended that you use a high level of creativity that breaks the norm and pushes users to see the star product, event, cause in the limelight. This explains that without some usage norms, visitors are more inclined to embrace the novelty. Fairly simple navigation. Generally, a microsite will have a main menu with a few buttons, clearly marked links, options to return to top of page (after having scrolled down to bottom sections), links to different sections of a page. Interactivity elements are required, if you want the microsite to really stand out. To help you make a picture of its role, imagine that interactivity elements will make the site more of an app. These items are creative design elements (suggestive for the topic of the microsite) that users can click, scroll, open, slide, move around, etc. They give a microsite the power to become memorable, as users get involved themselves in “experiencing” the microsite presentation. The trip generator integrated into the website is the best example of interactivity. 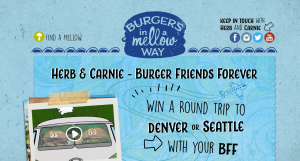 Here, innovation, fun and playfulness are at the core of a mechanism intended to catch users into the adventure of subscribing for a round trip to Denver or Seattle with their BFF. Invite to action. The main role of a microsite might be to invite visitors to action. This might take the form of a subscription, a purchase, the fact of contacting the company, etc. That’s why the website pages should include one or two clear calls-to-action, as well as directional cues leading users to these CTA buttons. This implies a catchy design and the main copy only have a secondary role, in supporting users’ advancement to the CTAs. Collect valuable data. A microsite can have the sole purpose of helping collect e-mails and other contact information from users. For instance, this will be valid for teasing campaigns where the microsite promises precious content in the days/weeks/month to come. In this case, the unique value proposition should be clear for that product/service/event, etc. and have the role of stirring up users’ curiosity on how that unique value will really impact them. Tell a story through the microsite. Imagine this scenario: The team puts themselves in the users’ shoes and accompanies them in an adventure they suggest to visitors and that might end by becoming theirs. The results will be visible in more conversions and sales. Bring to front the results of an ample and successful study made by the company. This serves more for branding purposes. The company has the opportunity to prove with facts and figures its value on the market, and that it’s worth of interest for users of the website. Reinforce the brand. Microsites, derived from main branded sites, should have the power to prolong a brand’s authority and its power to dominate customers’ share of mind: it inherits basic branding elements and gives them a refresh, through creativity in the microsite. The result will be a new expression of the brand reinforced with additional elements. An extension for the main branding, a microsite proves its value by providing long-lasting effects and bringing added value over time (regardless of the limiting conditions of events, particular buyer profiles, etc.). This belongs to the power of a brand to live over time (among other elements, you might consider a memorable color scheme, for instance). Ensure a tracking system is well put in place. A microsite has, among other roles, that of making it possible to clearly measure the results of a particular campaign. Thus, it allows for easily isolating traffic generated by that campaign, conversions or engagement with the microsite page sections. By the time the case study was posted, the microsite has attracted over 60,000 visits since its launch. The site has been accessed from 120 countries. Videos have reached about 1,700 views/month and banner ads have delivered about 100,000 impressions/month. Take the challenge of experimentation. A microsite can be the perfect tool for experimenting: you can test people’s reaction to a new offer, their interest for a new product, also gathering data on demographic, geographic or behavioural particularities of visitors who come to the site. In spite of their attraction, you should use them carefully and by being aware of some drawbacks they have. First of all, a microsite breaks the principles of good user interface design. One of them is consistency and coherence throughout design and content. You should pay special attention to avoid causing confusion when deviating from the standard design principle and traditional way of linking content elements. However, the counterpart is that creativity in building up a microsite plays a major role on brand impact, and facilitates memorable experiences strictly related to visiting the mini-site. Second, it is against usability of visitors who land on the main website and then are driven to the microsite, and to another design of pages dedicated to a certain campaign. After they got accustomed to how information is presented in the parent site, a certain tone of voice and a certain message, they’re driven to something else. However, the importance of the microsite holds true in terms of ensuring the prominence of a star product, service, event, etc. Third, there are additional expenses for microsites. When a company decides to create a microsite for a certain event or product, it’s important to calculate the needed investment and the expected benefits. If the results don’t seem to pay off, you should better stick to the main website, and enrich its content with what you have to transmit to users. Fourth, it’s important to plan a retirement strategy for the microsite, once its concept is no longer valid (an event that already took place, a product which is no longer new, a campaign that ended). In such cases, you shouldn’t let users land on 404 pages when the site is no longer available. Try instead to redirect them towards the main website. A nice alternative would be to create customized 404 pages, that ensure a continuity of the message that was once true for a certain campaign. These customized 404 pages will include a suggested link towards a current page of the main website, that’s intended to best answer users’ expectations. All in all, deciding to build a microsite needs careful consideration of the pros and cons. You might want to simply set up a microsite, without it being supported by an “online history” of a parent website, which is fine. Otherwise, if the pros weigh hard, you should start to build your microsite for your campaign. Knowing what design elements to pay specific attention to and creating the design with the website goals in mind, you should be nearer to the success of that campaign you want to make shine. You can now say you know how to microsite, right? Next: Next post: How to change site title in WordPress?